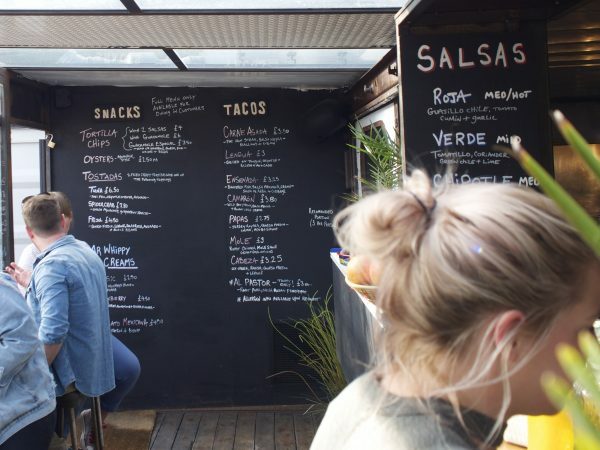 Barrio Comida - which translates as 'neighbourhood food' has been on our radar since we tried chef Shaun Hurrell's Californian spin on tacos at the Boilershop Steamer two years ago. 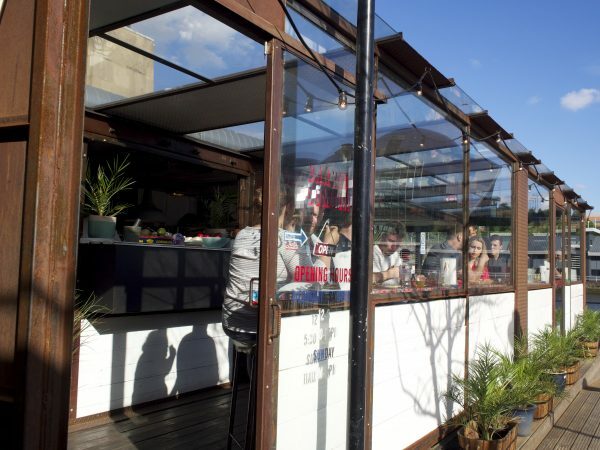 He's since set up permanent residency in a shipping container, helped by the guys at Riley's fish shack in Tynemouth. 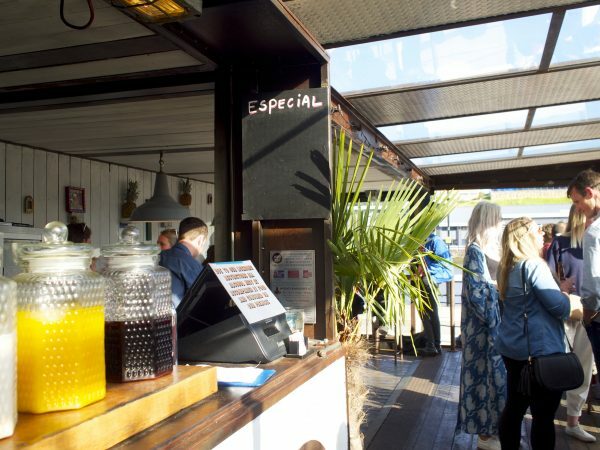 Situated next to the ‘Quayside Seaside’ and blasting cool summer tunes, it was the perfect evening for a rare date night and we were excited to see what was on offer. They don’t take bookings and the place is obviously compact, but the idea is to grab a seat where you can and not be precious about where you sit. We shared a table with a couple of strangers and it only added to the holiday vibe of the place. 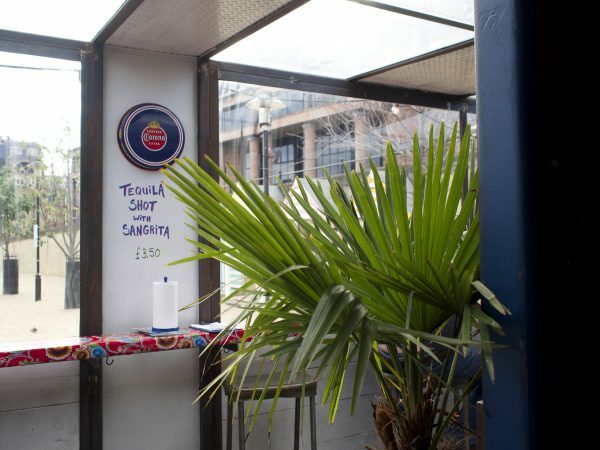 The menu changes daily but it’s made up of mainly tacos, tostadas, and some starters and desserts. You order at the bar and they bring things over when they’re ready much like a tapas place. Update: since we visited they’ve just announced that they’ll soon be offering table service and taking bookings for parties of 8 or more. We decided to kick things off with drinks, a cucumber and mint margarita (£7) for Mr and a hibiscus flavoured homemade soft drink for me (about £3). 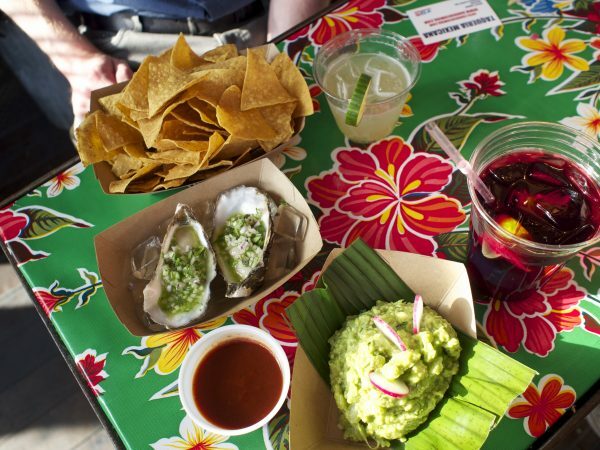 We also ordered some homemade tortilla chips and guacamole (£6) with salsa (£1) and a couple of aguachile oysters (£2.50 each). 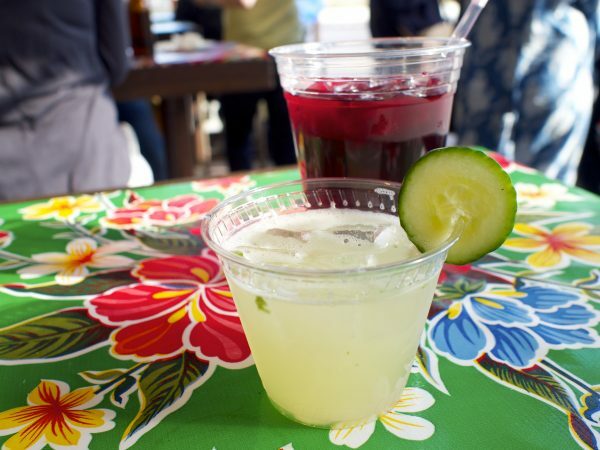 We didn’t have to wait long for our drinks, which came served in plastic cups – it’s all very rustic here. The hibiscus drink was something I’d sampled before at the Boilershop Steamer and it’s a deliciously unusual and refreshing drink. The Mr found his (first ever!!) Margarita to be very pleasant, with the mint and cucumber adding a nice flavour. The tortilla chips were as perfect as only homemade ones can be and the guac was zingy, fresh and moreish. The oysters were incredible, the Mr exclaimed that they were “even better than the ones at Cafe 21“, which takes some doing! 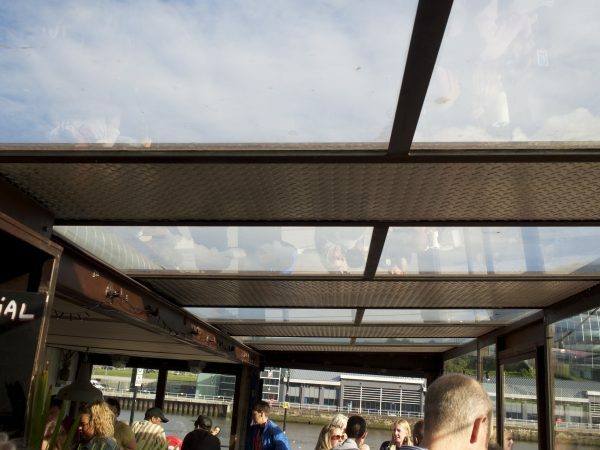 At that moment the Fresh Prince and Jazzy Jeff ‘Summertime’ came on the sound system and with the sun beating through the windows and views of the Tyne beyond we couldn’t imagine what could be better. Excited to try more we went back to order our ‘mains’. We went for prawn, steak and ox tongue tacos and spider crab tostadas. 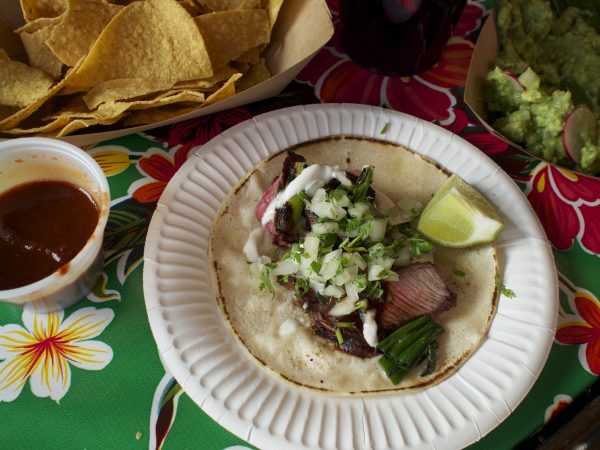 The first to come out was the ‘Carne Asada’ taco – flat iron steak, salsa negra, scallions and crema (£3.50). We could see the BBQ pit where they cook the meat in the open kitchen and the chargrilled flavour added to the awesome flavour combinations on offer. The tacos here are soft and delicious and combined with the perfectly cooked steak and all the other accoutrements it was a little parcel of pleasure. Next came the ‘Camarón’ taco – wild red prawn, salsa Macha and burnt Chile crema (£3.80). It consisted of breadcrumbed prawn and the head of the prawn was served on the side – we were told to squeeze it over the taco as apparently there’s a lot of flavour in it! It was a little messy (actually the whole meal was – part of the fun!) 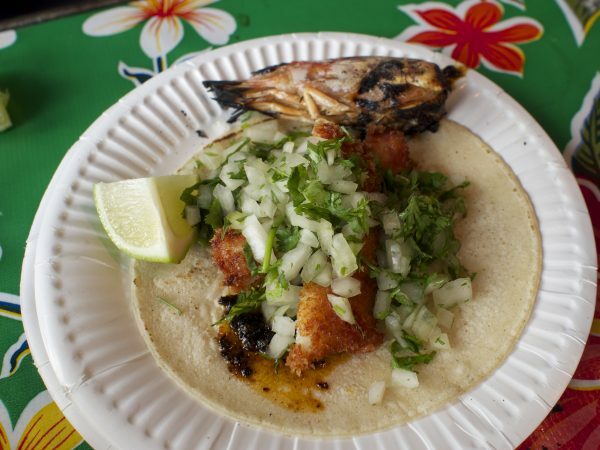 This taco was great, with the crunchy and tender textures combining with fresh coriander and onions. Quick note on the staff at Barrio Comida – everyone was super friendly and helpful. Each chef served the dish they’d prepared (including Shaun Hurrell) and there was a constant procession of food coming from the kitchen, each dish looking incredible. The Spider Crab tostada came next. It consisted of two fried crispy tortillas with salsa aguacate, grapefruit and radish (£7.80). These crisp tortillas were more like the tacos we’re used to in this country but tasted a thousand times better. 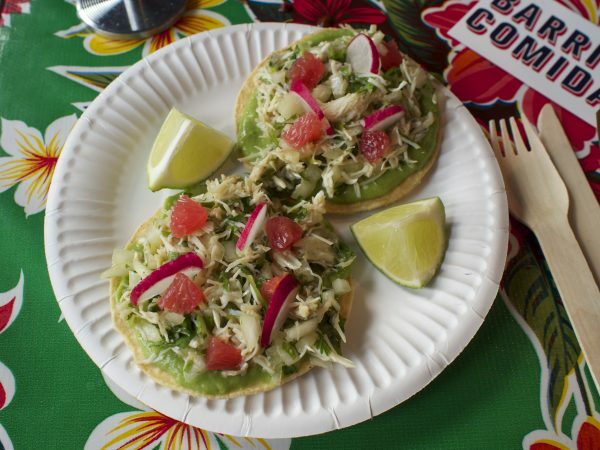 Creamy avocado, grapefruit, lots of coriander and onions complicated the salty spider crab perfectly. 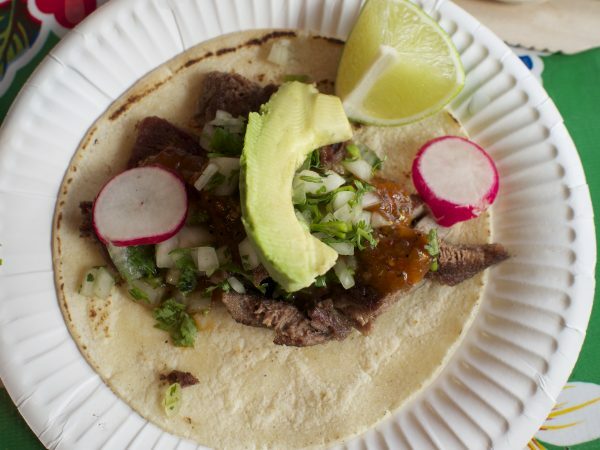 The last taco was the ‘Lengua’ – grilled ox tongue, chipotle, radish and avocado (£3). The meat was incredibly tender, it has obviously been slow cooked and then finished off on the grill. Combined with a slice of avocado and the chipotle sauce this was probably my favourite dish of the night. We were too full for the soft serve ice cream with creative flavour combos that are offered for dessert but will be checking them out next time. 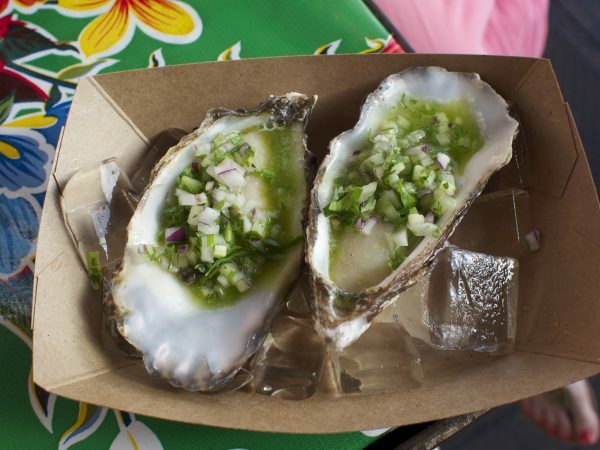 Barrio Comida is an experience, a fun place to be and most of all the food is delicious. If you love a party atmosphere, don’t mind getting your hands dirty and sitting next to strangers then you’re in for a treat. We will definitely be back, it’s great to see such a creative chef making a success of things!